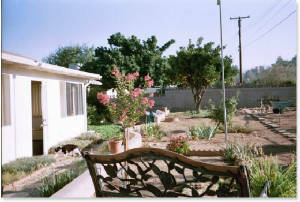 In my effort to create a park-like atmosphere, I purchased a park bench and added a crape myrtle tree for eventual shade. The cat walking towards the house is Shadow,our long-haired tuxedo cat. 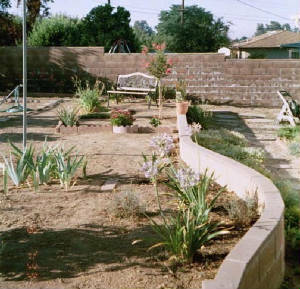 In photo 3, the plants along the curve of the wall are agapanthus, which were given to me by a friend shortly after I moved in. To the left of the agapanthus are tall, bearded purple irises that were given to me by a co-worker. 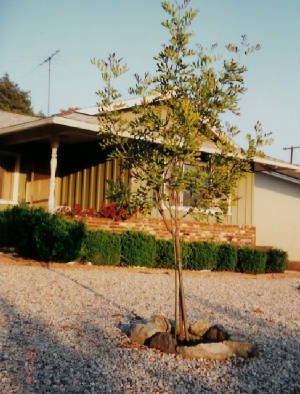 Photo 4 is the two-year old carrotwood tree that my grandson planted in 1998. 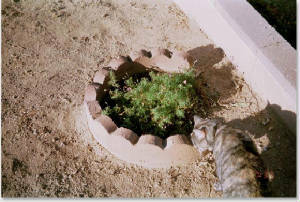 It didn't grow a whole lot in those two years, but since I wasn't sure that it would survive here, I was glad that it was growing at all!